Learn more about NGO Shakti Shalini's visit by Veolia India Women at Nehru Nagar, New Delhi, on March 7th, as part of the Girls on the Move Week 2018. 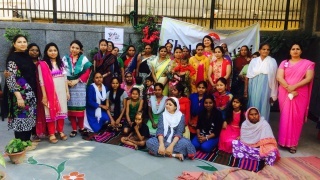 Veolia India Women visited NGO Shakti Shalini at Nehru Nagar, New Delhi, on March 7th, as part of the Girls on the Move Week 2018, to interact with all the women and young girls visiting the NGO for various vocational training and also for motivation which has helped them to become strong and successful. The women and young girls shared their experiences of challenges and how they have overcame them and have been able to become financially independent and are supporting their families. There were also women who shared the challenges they face with their dreams and aspirations in life. The women staff of Veolia shared their experiences and life lessons which has helped them to stay motivated and become successful in life. It was a beautiful opportunity for all the women to meet, discuss and support each other in believing in themselves and to achieve their dreams.